With Super Bowl XLVIII just two weeks away, we are all about to be inundated with ridiculous and hilarious prop bets spanning every aspect of the game day experience. In Part Two of a multi-part series, let's take a look at who the Super Bowl MVP will thank first. Prop: Who Will The Super Bowl MVP Thank First? Every sports book will offer a variant of this prop, but PaddyPower absolutely nailed this one. I don't know if we're going to find a better prop bet with better betting options than this one the rest of the way, although we are damn well going to try. But just look at these choices! Even though it isn't the odds on favorite, God is always the most likely outcome when dealing with postgame thank yous. That covers the majority of the players taking part in the game, as do the teammates, fans, family, owners, and coaches options. This is standard stuff The rest are specifically tailored towards two players, and they are what makes PaddyPower's version of this prop the best. Peyton Manning gets the nod in this prop with both the sponsors option, at an interesting 5/1 when you think about how you wouldn't exactly be shocked if he thanked Papa John before his family, as well as Omaha, which is America's favorite flyover state now that microphones have picked up Manning yelling 'Omaha!' dozens of times each game. The final two choices are geared towards Richard Sherman, whose verbal evisceration of Michael Crabtree has put Crabtree on this list. Given Sherman's decree that he's the best corner in the NFL on Sunday, one that dismayed many white people, it's no accident that Paddy Power has included the option for the player to thank his awesome, Super Bowl MVP winning self. 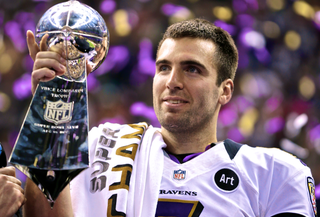 Super Bowl MVP awards have become a question of "who is the quarterback of the winning team?" over the last few years but, with a great list of choices in this prop, PaddyPower has me wishing that it could be someone else for a change.